It's sort of going backward, but this is a fun video I shot in Naples. I just discovered the coolest website for searching blogs. Technorati.com is like the yellow pages of what people are saying on the web. They already track GlamGal because I found three of my posts by typing glamgal into the search. So now they will find them all. Isn't technology grand? 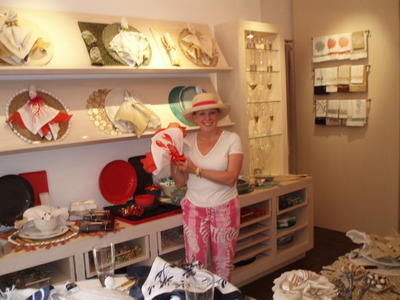 I've discovered the motherlode of tableware shops in the Hamptons... or elsewhere for that matter. Tucked into a little alley off the main drag of EastHampton are three to die for sources for linens, placemats, napkin rings and assorted other table ware. For me, the art of entertaining is how you set the table. This shop is Kim Seybert. Prices are very expensive but the quality and originality of the tableware is supurb. Some of the place mats are hand made with shells, others are hand beaded. 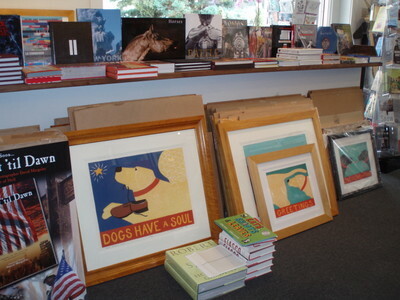 They also have an online display and you can order from the East Hampton Store. I'll set the table if you cook! 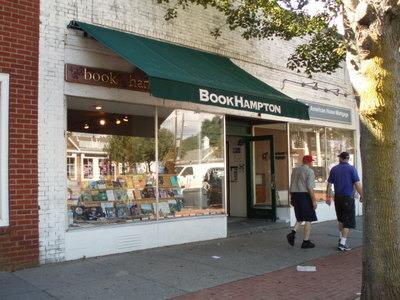 Spent the whole day in East Hampton. Great shopping. Best all over book store. See below for the beginning of this post. The packing up. Although the trip took three hours more than mapquest or my GPS positioning system said it would, I got here!!!!! Which brings me to a gripe. I know the fastest way to drive to the Hamptons from Pittsburgh is via the Verranzano Bridge... skirting the whole of Manhattan. However both mapquest and my GPS took me via the Jersey turnpike over the George Washington Bridge to the Cross Island Expressway and then to the Long Island Expressway and beyond. First, the accidents on the Pennsylvania Turnpike... morph into stop-and-go via construction on all roads and the toll booths where if you don't have an Easy Pass, you wait in line FOREVER!!!! I'm thinking of getting an Easy Pass for the three times a year I use the turnpike. Grrrrrrr. I was listening to a James Patterson novel for the second time because the first time I didn't finish it and didn't want to start from tape seven knowing I would have forgottenhalf the plot and be wondering what the heck was happening. Meanwhile, I still haven't finished it and since I'm driving home with Steve(hubby) who hasn't heard the first six tapes I may never hear the end. Should I call Jimmy and ask him for a cheat sheet? The other gripe I have about GPS is that they don't tell you where you are going. Mapquest is printable, so I knew I would be turning onto I ...blah blah and then onto Route x but on the GPS they simply say. Be prepared to turn in 600 feet. Okay. So I will be prepared to turn WHERE? Closer to the turn, I didn't know if I should be in the left lane or right lane.... then boom. 0 feet happens 5 feet after the turn!!!!! I really understand the commercials where the poor guy is following his GPS which says to TURN... so he does..... in 500 feet. I felt the same... not knowing where I was going and why. If I hadn't typed out my mapquest directions I would have been very worried. But, this says something about trust. Here I am in a car where I've paid ??? for this GPS system and I don't trust it will get me to where I need to be. Hmmmmm. Does that say something about me? Or does it say something about technology or trust? Daughter Lauren and Son-in-law Patrick arrived just a few hours later and we proceeded to have one of a series of Fiests. Night one was caviar and Champagne followed by steak on the grill with fresh corn on the cob and tomatoe mozzarella salad. So I must digress again to talk about the Long Island produce. New Jersey used to be known as the "garden state" until development overwhelmed the farmer's land and prices became too tempting for the farmers to hold out. Not so the Hamptons. Farmers...mostly the Halsey family are true to the land, their heritage and farming. The new generation is into organic farming and rabidly so. Thank the Lord. There is no better dessert than an ear of Long Island August corn. I eat it raw. My friends joke about letting me loose in a cornfield to pick and munch to my delight. What they don't know is that I've done it. Great munching except for the creatures that live in the fields along with the corn. Snakes, moles and voles are apt to ruin a good appetite. So I've given into the farm stand where I pay a ridiculous price for a bit of heaven. Last night an ear of corn at my favorite stand was $.50 But, hey, it's less than caviar and tastes just as good. But with that goes a local versus summer resident tug of war. 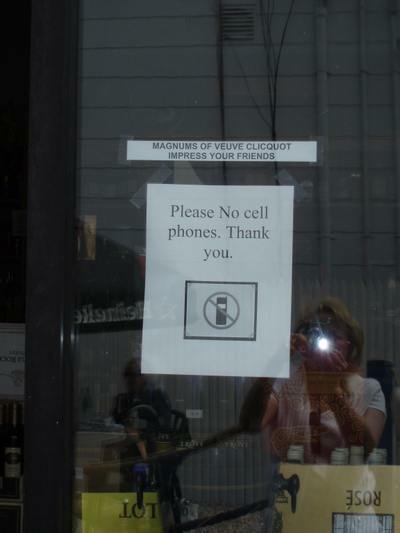 Seen here in a local wine shop which clearly benefits from the Wall Street Titans who are their clients and the "locals" who resent the brash/crass and offensive intrusion of cell phone conversations whenever and wherever they please. BUT-- Magnums of Veuve Cliquot... Impress Your Friends? A new passion: Mozzarella. As you know, Steve and I just got back from the Amalfi Coast where the Buffala Mozzarela was divino. Truly. So I wasn't expecitng to enjoy the same until another trip to Amalfi. Wrong. 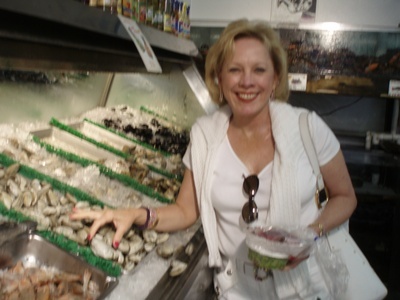 My buddy Molly has made friends with an Italian vendor at Cavaniola's in Sag Harbour who imports the same incredibly fresh Buffala. But don't get too excited because it is an insiders 'who you know". The Buffala comes in on a certain day and is promised like a bride to only those special customers who have ordered in advance. God love the Hamptons. Tomatoes. It's all in the soil. End of story. I've grown tomatoes at home. Not the same sweetness as the Long Island crop. If I die, it will be tomatoe/mozzarela/corn overload. And so it goes in the Hamptons. If you want a pie, stop at exit 70 and go to Breymere Bakery. You will write me thank you letters for this tip. Second night was a Lobster/corn on the cob and tomatoe mozzarella fiest. You will notice a similarity here. All main courses in the Hamptons are accompanied by corn and tomatoe/mozzarella. At least my dinners. :) When the kids were little we'd cook our own lobsters, bringing them home live for lobster races across the kitchen floor. But after a few years of this and then plopping them into the boiling water, the screaming got to me. I'm not making this up... wouldn't you scream if someone ploped you into boiling water? Ewwwwww. Not glam. 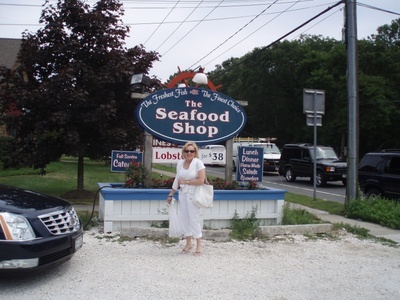 Now we call the Seafood Shop, order the sizes we want and pick them up right before dinner. Sooooo much more Glam. 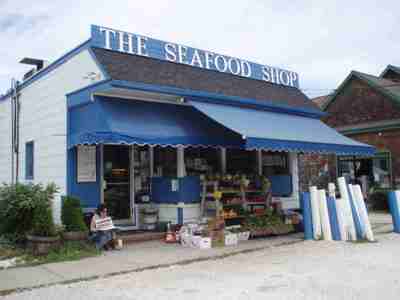 The Seafood Shop also has the most beautiful array of fresh fish, local and imported. Life aside from eating is tough out here. There's pool sitting, beach sitting and shopping. And of course reading. Doesn't this look tough? I'm loading the car for my 8 hour sojurn to the Hamptons. 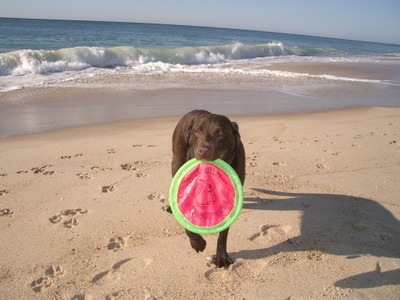 Every year Daisy (my lab) and I take a ten day respite at the beach with my bestest buddy and college roomate Marina. This year you can go along as I am taking the video camera (still not cameraman/woman) and my blackberry. 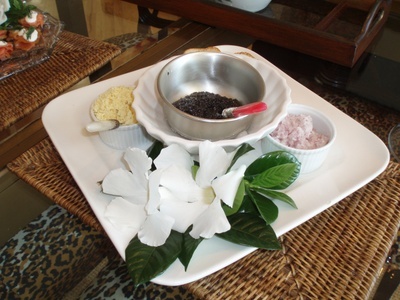 Tomorrow --daugher, son-in-law and hubby will be joining us for parties, lobster, caviar and champagne. We're celebrating a big birthday for Lauren, but I refuse to acknowledge that she's older than 21 so the number is a secret. Their big news is they put down a deposit on a baby chocolate lab who will be born sometime in September. Does that make Daisy an aunt, cousin or what? Maybe I need to get her a nanny hat? My dear friend, Sheila, the GlamGal responsible for my daughter's wedding being over the moon spectacular, is going to Paris for the first time and has asked my advice. OMG where to start? Paris is undoubtedly my favorite city. Yes, the Parisians can be annoying but, so can the Americans and almost any other group of people.... especially when you are tired and cranky from a long flight. But it's the sounds and smells and tastes of Paris that have captured my heart. They will be staying at the Westin which is right on the corner of Rue de Castiglione and Rue de Rivoli, across the street from the Jardin des Tuileries where this shot was taken. As you stroll to the Louve, this is a lovely way to go. For information pre-trip, I have two sources I love. So what to do in seven days? Don't hope to do it all. 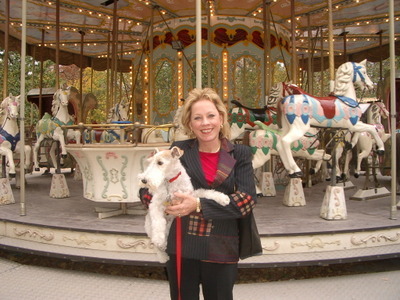 I've been going to Paris for over twenty years and constantly discover new things. I say on your first trip... be a tourist. The icons you CAN'T miss incluce (in no specific order) The Eiffle Tower, The Louvre, The Seine (cruise and walk), Ile de France and Notre-Dame, Arc de Triomphe and Champs Elysee, The Left Bank, Rue Fauberg St. Honore, the Bridges. DAY ONE: At the hotel, take a shower and ask your concierge for a city map and Galeries Lafayette discount card. Then head for the Eiffel Tower. It's walkable but if you are tired you can take a taxi. The Tour Eiffel was built for the Universal Exhibition of 1889 and was meant to be a temporary structure. Don't worry, it's sound. Visit the third level (905 feet above the city) and get your bearings. When your stomach starts moaning that it's dinner time, check in at the Jules Verne Restaurant (advance reservations a MUST). The dining and views are some of the best in Paris. Assuming you are having wine with lunch (why not... you're in Paris) it will be nap time. Trust me -you will be happier if you listen to your body the first day. Dinner the first day should be local. Again, you are adjusting and want to get on Paris time ASAP. I would suggest a neighborhood choice. Or ask your hotel's concierge. There might be a fab new spot right next door. 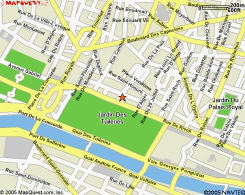 The best shopping streets however are Rue de Dragon, Rue de Rennes, Rue de St-Sulpice and Rue du Bac. 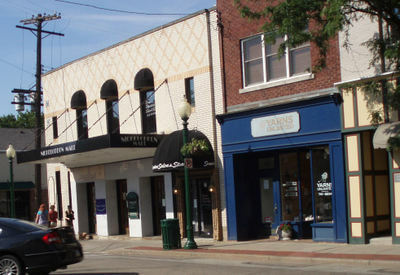 Lots of small shops, cutting edge fashion and young looks. Have lunch at Les Deux Magots, renowned, revered and steeped in pre-war history” (“imagine an espresso with Picasso”), this “landmark” Saint-Germain cafe, “though a tourist trap, never fails to delight” those to whom people-watching and “ambiance is all. Day 3: Sunday: The last place you want to be is a tourist attraction -- so head to the Champs Elysee. (8th arrondisement ) Not tourist really! Lots of stores in Paris aren't open on Sunday and museums are crazy with tourists in for the weekend. Champs Elysee is only more fun when it is busy. Start at Ronde Point de Champs Elysee (or walk from your hotel....and enjoy the formal gardens that line the walk from Place de la Concorde to the Rond-Point... designed in 1838 by Jacques Hittorff for the 1855 World's Fair.) Once you get to the Rond-Point stroll toward the Arc ( you won't miss it). Imagine the French armies marching up this grande avenue after the two world wars. Close to the Arc you will find Le Drugstore, a destination for most of the years I have visited Paris, but closed for the last two years. (133 ave des Champs-Elysees). 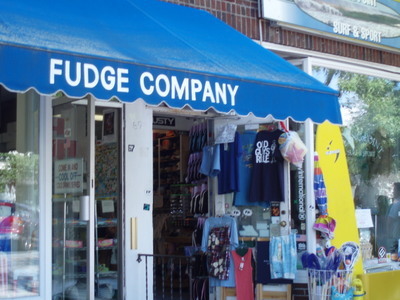 Now open it's better than ever and offers lots of snack/dining/tourist shopping venues. There is also fab shopping in this area on rue du Faubourg St-Honore but this is a visit for trip #2. Day 4: Real Shopping: Although Paris is home to beaucoup fantastic boutiques, the best bang for the buck will be to buy in a sweep... kind of like a panzer attack for all the things you know you want to buy. Thereby read Galeries Lafayette: www.galerieslafayette.com. Ask for the 10% GL visitor discount card from your hotel. Then when you enter Galeries Lafayette, find the hospitality desk, ask for your shopping pass (show your hotel's visitor discount card and passport) and seek all vendors who display the red dot indicating they honor the discount. Don't worry, most big names do. That on top of the 12% VAT you will get leaving the country ALMOST makes up for the lousy exchange rate. Here is the GF info on doing the paperwork. Note: Do this all in one day to make your to spend the amount needed for VAT. Have lunch at one of the Galeries Lafayette restaurants. How does the tourist tax refund work? What to do at Galeries Lafayette:- After making over 175.01 Euros of purchases, bring your sales receipts and passport to the tourist tax refund (détaxe) office located on the mezzanine of the ground floor of the main store (Lafayette Coupole). - You will then be issued a Tax Refund Form ("bordereau de détaxe") consisting of two sheets to be signed by the retailer and yourself. Please note that the person who made the purchases must be present when the tax refund form is issued.What to do when exiting the European Union: Before checking your luggage, present the tax form together with your purchases, passport and transportation ticket for inspection by Customs. Day Five: Culture : I know shopping is a top priority but at this point you need to justify your trip. Trust me on this. When friends say... so what great things did you see in Paris, and all you tell them is shopping, they will wrinkle their noses and condemn you as a blonde.. and I know you are a brunette!!!! So bring on the Mona Lisa, Rodin Museum, Musee D'Orsee and all the other cultural icons. You can spend the whole day at the Louvre but your brains will be fried, so I suggest you pick the erass that speak to you and leave in time for a late lunch at the cafe across from I.M. Pei's triangular glass entry. On the patio. Days 6-7: So much left to see. At this point you need to decide your priorites, There is touring or more shopping. Let me know. I live in a neighborhood that is so cute it makes you want to put on an apron and cook. Well, some of us might want to cook. I just keep hoping for more resaturants. 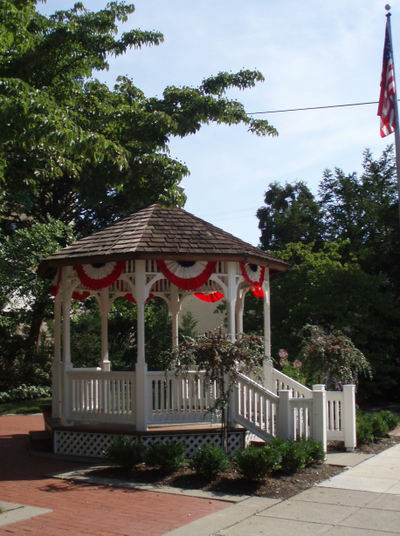 This is the gazebo in the middle of town. The local garden clubs keep up the planting and the village decorates for all holidays. Can't you just see the marching band? 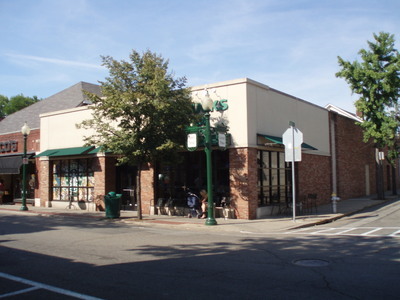 Of course every town needs it's Starbucks. 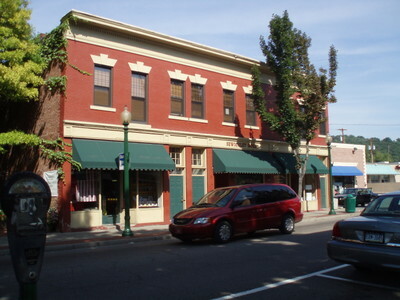 And Sewickley Hotel..which used to be a hotel in the Stage Coach days...but is now a restaurant. Aren't those lightposts just tooooo cute? It is a Hollywood set. 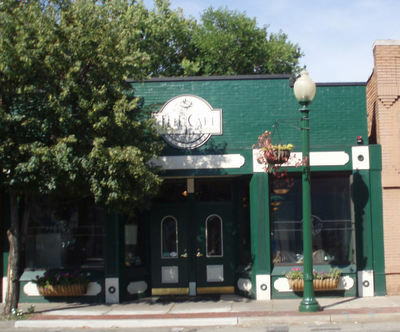 This is the Sewickley Cafe...another great hang out. And maybe I love it so much because the main group of stores has my name. I'm told that the Thomas Building was a theater at one time. As defined by Cosmo or Sykes (Joe Pantoliano and Daniel Roebuck respectively) in the 1993 movie "The Fugitive". In a conversation in the Federal building, Cosmo, Sykes and Sam Gerard (Tommy Lee Jones), the situation with Dr. Richard Kimble (Harrison Ford) is described as Hinkey, meaning that it is strange or unusual. Gerard exclaims that he does not know what that means and doesn't want them using words around him that he does not understand. Hence, if something, or someone is hinkey, it is strange and/or unusual. Seeing the sun shine while it is pouring down rain is hinkey. He was acting hinkey, I think he's on something. Don't get hinkey with me, mister! Doesn't that seem a bit hinkey? If you go to www.urbandictionary.com check out the definition of GlamGal !! !